Timothy Youngblood, of Lima, charged with murder in the July 9 stabbing of his father, was ruled incompetent to stand trial during a hearing Thursday in Allen County Common Pleas Court. Youngblood was ordered to undergo treatment at the Northwest Ohio Psychiatric Hospital in Toledo for no more than one year. He is pictured with his attorney, Joe Benavidez. A report authored by a doctor at the Forensic Psychiatric Center of Western Ohio concluded that Timothy Youngblood is currently incompetent, but there is a “substantial probability” that he could be restored to competency within one year after undergoing treatment. Allen County Common Pleas Court Judge Jeffrey Reed ordered the psychiatric report to remain confidential but did make an official ruling that the defendant is not competent to stand trial at the current time. Youngblood was ordered to be transferred to the Northwest Ohio Psychiatric Hospital in Toledo for treatment, with a report on his progress and competency to be submitted to the court within one year. 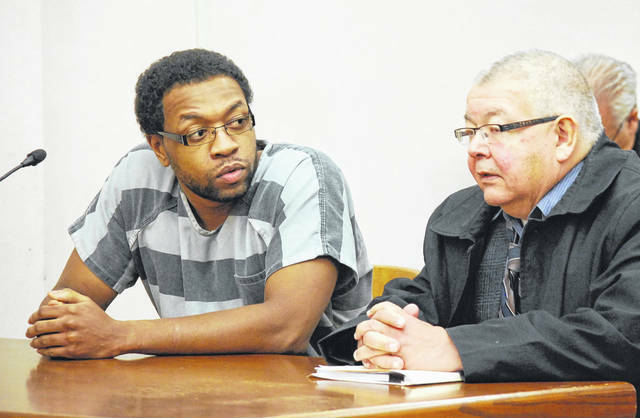 Youngblood, who will turn 32 years old on Saturday, is charged with murder in the July 9 death of his father, 65-year-old Van Youngblood, at the elder man’s residence at 311 E. 14th St., just south of the Lima corporation limits. Sheriff’s deputies were dispatched to the East 14th Street residence on the morning of July 9 following a 911 call from Wilma Youngblood, the victim’s wife. Detectives testified in earlier court hearings that Van Youngblood was already deceased upon their arrival at the scene. Timothy Youngblood was taken into custody after being discovered in the garage of the residence. Detectives said the elder Youngblood had been stabbed “multiple times by a sword-like weapon” that was taken from a military-style shadowbox display in the family home. Reports indicated the glass had been broken and the sword removed from the display case. The Ohio Bureau of Criminal Investigation was called, at the request of Sheriff Matt Treglia, to assist with the investigation and to aid in crime scene processing. Timothy Youngblood was charged with aggravated arson in 2015 and eventually pleaded to a lesser charge of attempted aggravated arson. The court-ordered mental evaluation of the Lima man at that time found no evidence of mental illness and stated that the defendant was neither mentally ill nor mentally incompetent.